. 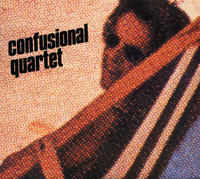 :: Elica Editions ::: Confusional Quartet ::. Futurism with its dynamic force, youthful spirit, attention to innovation and a bit of Italian histrionism; the sixties with their hopeful and playful atmosphere and their crisp and catchy music; Italy with its beautiful sun, beaches, Mediterranean brightness and laxity; minimalism with its focus on the deepness of details; all the things happening in Bologna in the late seventies, among some of the newest and most inventive experiences in film, performance, fashion and music. With these elements and a strong, confessed musical influence of an unlikely pair like Area and Devo some of the most original and fresh music ever was produced by the Confusional Quartet (Lucio Ardito, bass guitar; Gianni Cuoghi, drums; Enrico Serotti, electric guitar; Marco Bertoni, keyboards), with the help of the inventive craftmanship of their sound engineer Gianni Gitti. Composed as short, fast changing miniatures with crazy rhythms and outstandingly playful and catchy tunes, blending diverse musical genres, very nicely arranged and enriched by a creative use of the recording studio, the 24 pieces collected in this disc represent their almost complete recorded output (including alternative versions and a previously unpublished piece) and show a musical maturity which is quite amazing for a group in which three members out of four were at the time still under 18! As a special bonus, the disc features a video track with Gitti's videoclip for the Quartet's irreverent, almost cubist version of Mimmo Modugno's internationally known classic Nel blu dipinto di blu (better known as Volare). Digi-pack type cover with 12-page full-color insert containing texts in Italian and English (notes by Marco Bertoni and original review by Red Ronnie), photographs, archive material and reproductions of the original record covers.